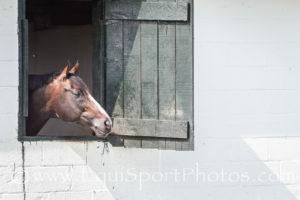 Lexington, KY – September 21, 2016 – Sovereign Kit, one of the Thoroughbred Retirement Foundation’s only stallions, was euthanized last week due to complications from colic. He was 19 years old. An Argentinean bred Thoroughbred; Sovereign Kit began his career in Argentina before making his way to the New York circuit. Sovereign Kit went to post an impressive 85 times with lifetime earnings of $440,032. Retired to Blackburn by owner Maggi Moss, his second career was as an equine teacher at the TRF Second Chances Program. Kit, a kind but strong willed horse, taught the inmates at Blackburn a higher level of respect and reverence for horses. Sovereign Kit will be missed at Blackburn by those who cared for him and had the opportunity to meet him.